What’s going on with Eddie Lacy? It just seems Starks is having a better season so far with more explosive plays. Should we be concerned? Is something up we don’t know about? Lacy has been recovering from an ankle injury. I’m assuming that’s the reason, but we can’t know for sure and the team isn’t going to tell us if it is because to tell us is to tell the opponent. My advice is don’t overreact; we’ll know in time. “You want to pass it? Run it.” Keep pounding the ball! If you were a Packers opponent, would you watch the tape of this game and load up against the pass? I wouldn’t. Vic, since you love khakis, you must also be loving these throwback uniforms. If I bought one of these jerseys, every day would be throwback day. Are the Chargers trying to dink and dunk to keep the Packers’ pass rush from getting home? I think the injured state of their offensive line has quickened Philip Rivers’ internal clock. Vic, the Hawkeyes have had two different runners rush for over 200 yards the last two weeks and are only allowing 74.1 rushing yards a game. We are taking what we want right now. It’s been fun to watch! Keeping taking what you want and you might have a chance to take what you want against Ohio State. Vic, I thought the Chargers offensive line was suspect; they look pretty good so far. Rivers’ fast release is working very well. The pass rush caused him to rush his throw for a wide-open Antonio Gates in the end zone, missing him badly. When that happens, the pass rush has effectively “sacked” the quarterback. I’m happy with the defense so far, but are we giving up short passes so we don’t get beat deep? If so, I would have the DBs press harder since we’re getting pressure on Rivers; he doesn’t have time to go deep. Do you want to win the stats or the game? Vic, Rivers gets rid of the ball so fast. How do you defend against that speed? It’s rush or cover. If he’s going to throw short, you cover. Dom Capers has already made the adjustment. The first three plays of the game tipped the Chargers’ game plan: quick, short, ball-control passing game. It makes sense. Coach Capers probably expected as much. Why no logo on the helmet today? It hadn’t been created when the Packers wore these uniforms. How would you describe the first half defensive performance by Green Bay? Outstanding in a way different from the previous two weeks. This one is being achieved by playing it straight. The Packers defense can rush and it can cover. Pick your poison. 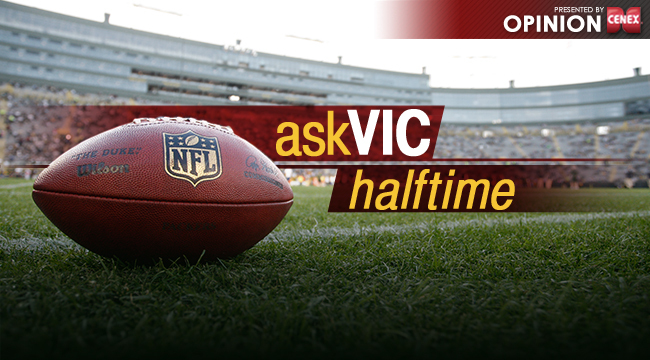 Vic, just wondering how many questions you have in your inbox relating to Janis’ deep catch. My inbox has been giggling ever since. Enjoy the second half, everyone. Remember, no chortling. After that Keenan Allen catch at the goal line, when does a catch become a catch? I don’t know what a catch is, but when I saw the replay, I thought they were going to reverse the call. The replay I saw, however, was blurry. Maybe that prevented them from reversing the call. The ball was in the receiver’s hands and the ball was above the goal line, in my opinion, but, again, the tape was blurry.